I COULDN’T WAIT TO START DATING!!! Why am I supposed to wait to date? I am being honest and real, I didn’t wait. I liked someone so I went at it. Yikes…bad girl! Bad girl! I was never one that sat too well with rules, my aunt worked at Mattel and she had one of the first Barbie and Ken dolls. The one that was mod looking with the thick black eyeliner on her top eyelid and she was wearing this black and white bathing suit, Ken had on these red trunks. She had her poseable dolls on the banister with their legs crossed, prim and proper, and poised and perfect. I was told specifically, “Don’t touch the dolls!” but then my mom and my aunt left me ALONE! IN THE SAME ROOM WITH THE DOLLS! DID I MENTION THEY LEFT ME ALONE!! I was only seven! Come on isn’t that like putting a steak in front of a lion and saying, don’t eat the steak??? Come on they were poseable!!! 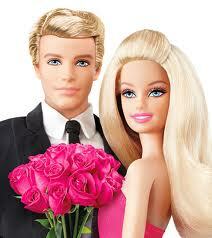 So I am standing there right in front of Barbie and Ken AND THEY ARE STARING ME RIGHT IN THE EYE!!! We were all staring at each other!! I know we were, it wasn’t my imagination! I knew at that moment I was missing out on something humoungous by not being able to touch them, I knew my life would always be missing that something because I wasn’t allowed to just touch them. Why couldn’t I just touch them with one finger? My life would always be wrong! I knew it! But then again, I was in the room alone and I knew they were talking, and when they talked, they didn’t care about anything else in the world except about what they were talking about. Just one teeny tiny touch wasn’t going to hurt anyone…Right? Well, don’t ask me how I got from point A to point B but next thing I know I am on the floor and Barbie and Ken are naked and doing it and all the middle is a blur and I have no recollection as my mom and my aunt are standing over me demanding to know what the Hell am I doing? This has always been me, even as an adult. I go into an art gallery that says don’t touch, for some reason I feel the same way, my life will somehow be missing something and will never be the same if I don’t just touch it…just a little bit…I have to lightly touch it with my pinkie…drives my daughter nuts. So this rule about not dating for a while, well maybe it is the best but, like I said, if you say left, I am going to go right just to see what is there, AND THEN I will go left…I can’t help it. Just sparks up that curiosity even more when they say don’t. They speak about respect, self-respect, healing, finding yourself, learning to find yourself, learning to be with yourself. I think, isn’t there a blog I could read and learn all that, oh yeah, it is about experience. Aye, aye, aye. I’m the original rebel without a cause and I can’t say the Barbie made me do it. I applaud you women out there that did have the inner strength to wait and work on you, I guess we will see. It was the apple, that darn apple…darn Eve! Reblogged this on Starting Over After 50. Previous Previous post: THE EVIL INSIDE OF YOU…. Next Next post: FEELING BEAUTIFUL AGAIN!! !